We are team – Zenith and we will like to share our experience at the ongoing She Hacks Africa coding bootcamp, cohort 7 – Week 1. The program kicked off on Monday the 3rd of September, 2018. We were introduced to our amiable facilitators and participants: Tolu, Funke and Sidney. The classes, to our pleasant surprise started immediately with a lecture on How the Internet Works delivered by Funke. We proceeded on a short break with refreshments served by the foundation. We continued with HTML programming which was anchored by Sidney. The lecture was intensive yet simplified. We rounded up the day with an assignment to be submitted the next day. On Tuesday the 4th of September, we started the day with an interesting ice breaking session anchored by Funke followed by “Introduction to Customer Discovery and Design Thinking” and “Social Entrepreneurship: Strategies for Impact”by Tolu. The classes were remarkable as we learnt design thinking framework and the discussed several ideas implemented by Social Entrepreneurs around the globe. A project that was of most interest to the class was the Play Pumps Project- an initiative executed in South Africa where children play on a merry-go-round that pumps treated water simultaneously. Each group was later assigned a task to wit- Ideate, design and implement a project solving a pressing issue in Nigeria with the use of technology. After a brainstorming session, our team came up with the idea of solving health challenges by creating a website that offers ambulance services for medical emergencies. The Wednesday session began with an Introduction to CSS (Cascading Style Sheet), the web tool used for the design layout of a web page. On Thursday, our classes resumed with the continuation of CSS lectures. We were taught more properties and commands in the use of CSS. It was a brain racking session but it was worth the while. It has been an interesting and brain tasking week. The journey so far has been beautiful we have been learning and having fun too. We look forward to learning more in the coming weeks. 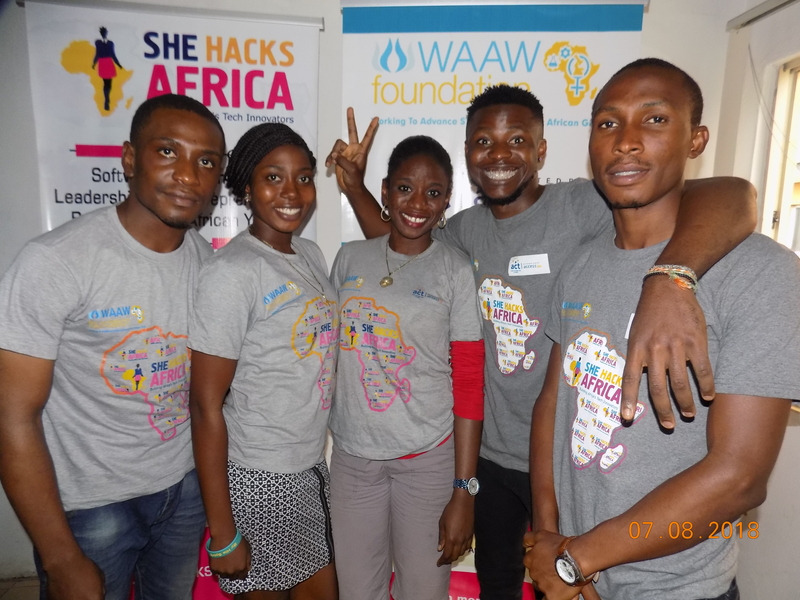 Thanks to She Hacks Africa, we are gaining a lot of confidence in our coding skills.